It's the holiday season, and just about everywhere you look, there's something delicious. Financier is also offering some new sandwiches, including a "breakfast all day option" -which, for someone like me, is ideal. I had the Bacon and Cheddar on a Croissant with the optional Egg Souffle, and quickly remembered why wearing black is just not my forte'. "Croissant" had become the new black... as the flaky pastry had me looking like I should have used a bib! Seriously good, but not my best fashion statement. Other selections included Smoked Salmon on a Croissant, Ham and Swiss, Mushrooms and Chevre, Honey Dijon Turkey and Brie, Chicken Salad and Bacon, Roast Beef and Taleggio, Tomato Mozzarella and Pesto and the Sprouts and Hummus --- lots of choices, so bring your appetite. If you want a soup to warm you up you must try the butternut squash - you can even do the half sandwich soup or salad pairing. But personally, I'll also add that I'm all about the holiday cookies this time of year - so just add that to my list of "must tries" at Financier. 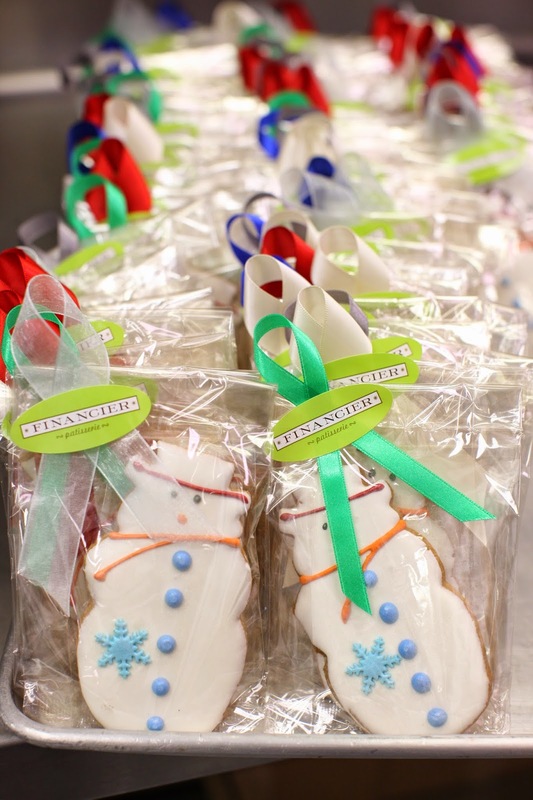 They have a hand decorated sugar cookies that include a gingerbread man, a Christmas tree, a snowman and a star. And for my Jewish family and friends, they also have sleeves of blue and white macarons available for Hanukkah. Oh! And one thing I found interesting that is not blatantly advertised is that the coffee is local. It is a new dark roast that is blended and roasted in a Brooklyn roastery. (Ok, I'll fess up: I did not know that there was a term "roastery" - but I heard it here.) Anyway, the four bean blend is comprised of a Brazil French roast for body; a wonderful Central American coffee gives it some fruitiness and tang; Sumatra adds a syrupiness and thickness to the brew and some African Peaberries to add earthiness and character. It’s like traveling around the world without leaving your neighborhood --and all in one sip!